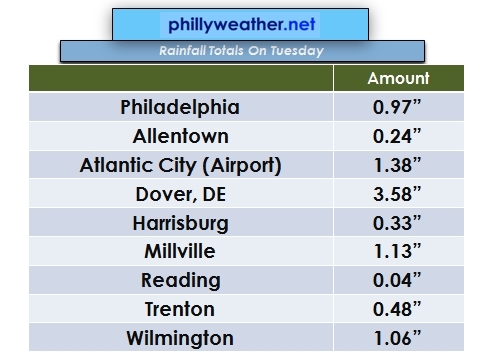 Rainfall today varied widely around the region -- from next to nothing in Reading to three inches of rain in parts of Chester County, as well as in Central Delaware, to about an inch along I-95. Scattered, slow-moving thunderstorms did a number on portions of the region during the midday and early afternoon hours. If it wasn't heavy rain, the isolated severe weather that knocked down some wires and brought gusty winds was an added insult to injury for parts of South Jersey and Southeast Pennsylvania. The culprit yesterday was a slow moving cold front drifting down through the region, working through a tropical airmass and helping fire up showers and storms that not only produced a lot of rainfall but also moved very little. What's left out there this evening will diminish as the night progresses...and tomorrow, thankfully, will be much less humid by the time you head home from work.